Killer Characters: What's in a name? 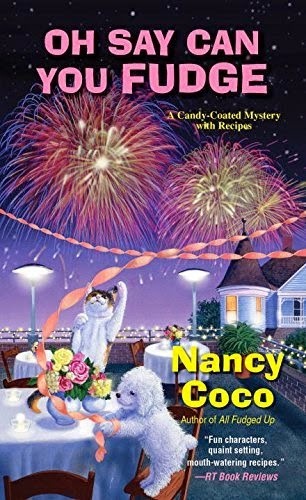 Hi All, puppy Mal here from the Candy-Coated Mystery series. You can see from the cover of our up-coming new release that we have a new addition to the series. She is a cat. A calico cat to be exact. I'm a dog, but I don't mind cats. I noticed that they smell different and act a little stand-offish at times. Poor Allie, my owner, doesn't know what to do with a cat. You see she didn't have any pets growing up and now she has me-but I'm easy to love and train. This new cat is completely untrainable and most importantly doesn't like to play tag with me. Allie is worried about a cat in the fudge shop area of the Historic McMurphy Inn and Fudge Shop. I don't blame her. Cats aren't known for knowing how to mind their manners. I think the cat should have a crate like me, but Allie says cats think differently and don't love dens as much as dogs. So, while Allie figures out what to do with the new kitty, I thought it would be great to have a kitty naming contest. My author thought it was a great idea and asks that you go like her author page on Facebook. There you can enter the contest and win a nifty prize. So click here for the link: www.facebook.com/nancyjcoco like the page and leave your suggestion on our name the kitty contest. Good luck! On a side note, I'm running my own poll. I think dogs are best, but cat thinks cats are best. Comment below and let me know if you are a dog person, a cat person or both. Dogs are great. Cats are okay. Cats rule. Dogs are okay. Both! Cats are easier to own in an apartment. I always feel a little sorry for dogs who are stuck in one. Sorry, Mal. I like some dogs and you sound like a terrific one, but I have had some close calls with dogs in the last few years that make me rather afraid of dogs. I do like cats. Your new kitty is cute! While I am currently "owned" by two cats, I have had a dog, so I would say I like both cats and dogs. I love both, but cats are easier to take care of. Cats and dogs are both wonderful in their own way. Definitely, dogs. Our family has 4 Golden Retrievers, each a specially trained service dog. We can't imagine life without them. Our daughters also like cats, but I'm severely allergic to them. Mal, your new kitty is cute. Maybe you can "train" her! It would be dogs but my daughter is allergic. Strangely she is not to cats so we have cats. I think they're both great. Well, it all depends on what you want. If you want someone to protect and bite for you, a dog is the best bet. But if you need someone to eat your hair, a cat is your person. Wait... yes, dogs and cats are people too! Definitely a dog person. I actually have a fear of cats.